Above & Beyond - We Are All We Need. Vinyl LP, CD. Anjuna Music Store. Following their critically acclaimed LPs "Tri-State" and "Group Therapy", as well as the innovative Above & Beyond Acoustic project, "We Are All We Need" ranges from anthemic festival tracks such as "All Over The World" and "Fly To New York" (feat. Zoë Johnston) to downtempo moments like "Little Something" (feat. Justine Suissa) and the melancholic "Sink The Lighthouse” (feat. Alex Vargas). Also included, of course, are the previous singles "We're All We Need" (feat. Zoë Johnston), "Blue Sky Action" and "Sticky Fingers" (feat. Alex Vargas). 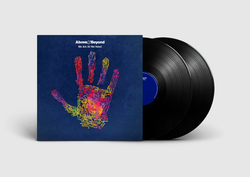 The album’s distinctive hand-print artwork is made up of the names of A&B fans from all over the world - plus the names of the band members and album contributors.